Los Angeles football fans have been rejoicing since the announcement of the city’s first football team and expected stadium. The NFL vote of 30-2 in favor of bringing the Rams back to Los Angeles, specifically Inglewood, has skeptics wondering what kind of impact it’s going to have on the local housing market and economy. 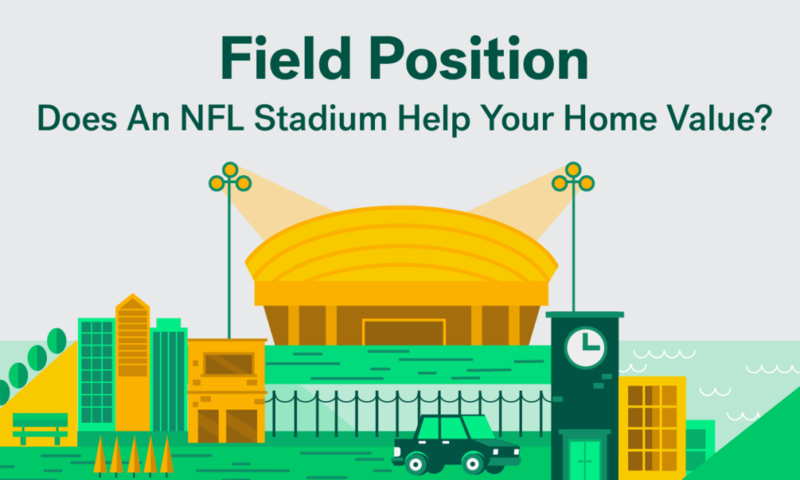 Trulia compared the current real estate conditions within a 2-mile radius of existing NFL stadiums and how stadiums built within the last decade impacted nearby home values. Two-thirds of the 31 stadium neighborhoods have higher average housing values than houses in non-stadium neighborhoods. Inglewood, Calif., has home values are 8.9 percent behind the region’s. 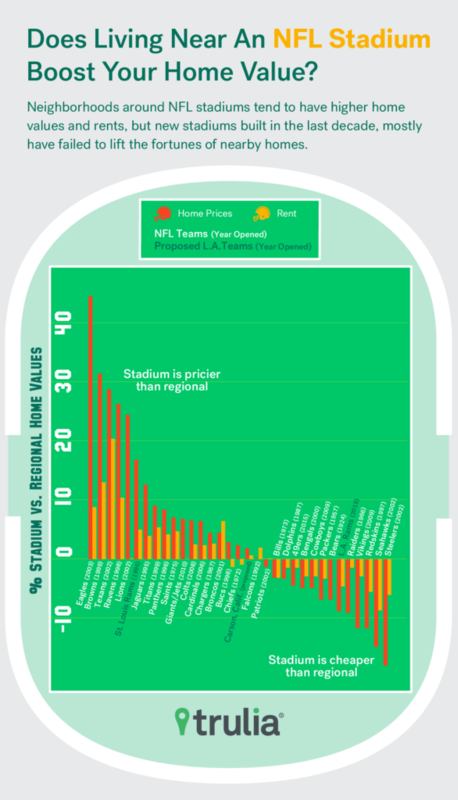 Five new pro football stadiums have opened in the past decade, all with no noticeable impact in raising home values within a 2-mile radius. Residents surrounding the Philadelphia Eagles stadium, Lincoln Field, are the luckiest in the nation with home values 44.3 percent higher than the regional home values. Houston renters near the Houston Texas’ NRG Stadium have rents that are a whopping 20.4 percent higher than the regional rent. The home of the San Francisco 49ers, Levi’s Stadium in Santa Clara, opened in 2014. 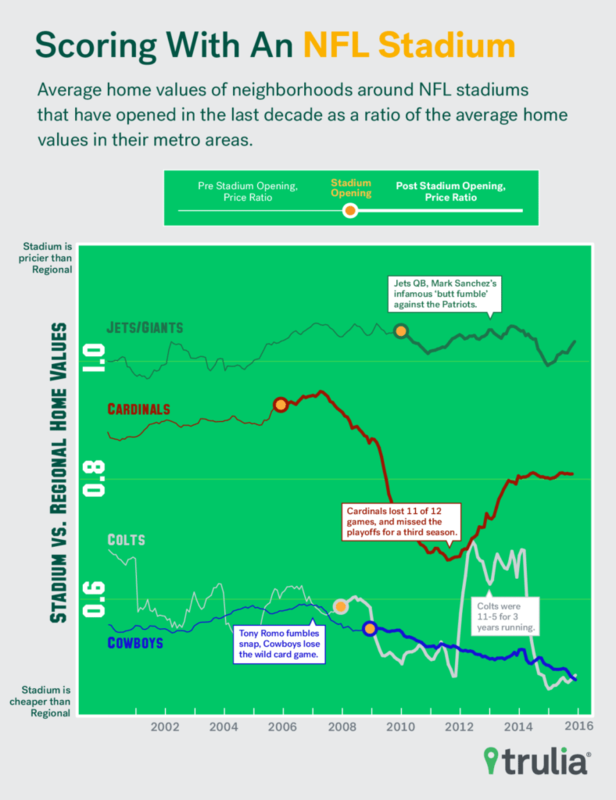 Home values surrounding the stadium are 4.5 percent lower than the national trends. The rental prices are 1.4 percent lower than the region’s average rent.